A restrained start at first with the alcohol being very present. After a while, however, sweet and old sherry arrives, nicely mixed with vanilla, toffee and acacia honey. Then dark fruits emerge with plums and dates, before notes of black tea, tobacco leaves and oak show up in the back, followed by a hint of smoke. Bold and intense on the palate with the sherry sweetness being slightly more present compared to the nose. Fruity with plums, dates and raisins, followed by milk chocolate. Then slightly warming spices of oak, pepper and subtle nutmeg arrive, before spicy acacia honey, tobacco leaves, subtle walnuts and dry notes of black tea take over, accompanied by a whiff of smoke towards the finish. The finish is long, warm and creamy with sticky dark fruit jam and caramel, followed by dry notes of oak, tobacco leaves and subtle cloves. Pleasantly mouth-coating. Water tames a bit of the alcoholic bite in the nose bringing more sherry and honey sweetness to the fore. Very spicy on the palate with cracked black pepper and oak, with a sweet core of sherry, dark fruits and caramel in the back. The finish is still long and warm, but becomes very dry with oak and tobacco leaves. 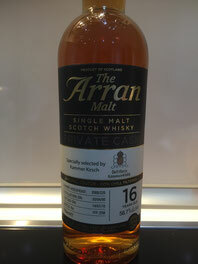 This limited special bottling of Arran is very strong and intense at the beginning due to its alcoholic bite. Later, however, it captivates with a delicate bouquet of sherry, dark fruit and spicy notes that can also be found on the palate. Despite the high strength of alcohol, this dram hardly tolerates water, as the delicious sweetness disappears and the malt becomes distinctly spicier and drier.